Turns out Ron Quinton’s just an old softie after all. The battle hardened veteran rode 2168 winners including 46 Group 1’s during his spectacular career as a jockey. In 25 years as a trainer he’s won hundreds of races including 6 Group 1’s. He’s the last bloke you would have expected to be visibly emotional after Dixie Blossoms finally got the Group 1 monkey off her back, with an authoritative win in Saturday’s Coolmore Classic. There were several reasons for Ron’s reaction. Firstly he was thrilled to provide owner/breeder Alan Osburg with a value enhancing Group 1 success for the prized mare. Image courtesy Bradley Photographers - Dixie and Christian Reith had the Coolmore to themselves. With six wins in the great fillies and mares event (two as a jockey and four as trainer), Ron has become very close to the race itself. It was billed as the Rosemount Classic when he won the inaugural edition on Miss Personality in 1973. He won it again on the great Emancipation in 1984. Dixie Blossoms became his fourth training success after Ofcourseican (2012), Peeping (2016), and Daysee Doom (2018). He understood better than most, how much the win meant to Christian Reith who hadn’t ridden a Group 1 winner for two years and has been riding at Kembla and Newcastle Saturday meetings of late. The jockey had actually taken rides at the Gosford meeting, but was able to gain a release from those commitments when Ron offered him the Coolmore ride. Christian had ridden Dixie Blossoms on five previous occasions for a win in the Gr 2 Guy Walter last year, and a couple of placings. He’s one of many to have formed an attachment to the sweet natured six year old mare. Image courtesy Bradley Photos - Ron Quinton just loves Dixie Blossoms. Ron Quinton’s fondness for “Dixie” is well known around the stable. “She has the kindest nature and the most perfect manners”, said Ron over the weekend. “You could let her go on High St and she’d just wander back inside when she was ready”. For trainer and jockey, Saturday’s win was very special, but for Alan Osburg it was monumental. “I know it’s a well-worn expression, but this mare richly deserved a Group 1 success”, said Alan . “She’s the most magnificent animal to be around and is admired by everybody who has anything to do with her”. Alan Osburg spent thirty years as a partner in the long established law firm Hicksons Lawyers, but opted for a change of direction in 2004. Rather than participate in the administrative involvement required of a partner, he moved to the consulting role he fills to this day. His expertise is keenly sought after in the areas of Corporate and Commercial, Government and Public, Private Client Services, Property Services and Property, Planning and Development. Dixie’s owner/breeder Alan Osburg, on the job for Hicksons Lawyers. Like many before him, Alan Osburg “happened upon” the racing game. In the 1980’s he was working with an articled clerk whose father was a former jockey and a pretty handy tipster. “It wasn’t long before I was having a little dabble and backing a few winners”, recalled Alan over the weekend. “At the same time I was acting for a client who was involved in thoroughbred bloodstock. When he was unable to settle his legal bill, he offered me a free service to an imported American stallion in which he had an interest”. Now firmly in the grasp of the racing bug, Alan negotiated the purchase of a broodmare from a Canberra stud. The mare Show Waltz was a daughter of the fashionable stallion Showdown, and to Alan’s surprise had a colt foal at foot by Bernard (Baguette-Tasrana). “That colt foal gave me a flying start as an owner”, he recalled. “We called him Bernucci and gave him to a country trainer called Ted McLeay on the mid north coast. He won ten races all up at Wyong, Gosford, Taree, Port Macquarie and Newcastle. Next thing I know I’m at the Inglis Easter Sale, completely and utterly addicted”. Alan began quietly, buying only fillies and never more than one at a time. He bought the best pedigrees he could find within his budget, mindful that a filly from a winner producing family would always generate some residual value. He had a stroke of luck when he purchased a grey filly by Lure from a Canadian mare called Hooked Bid. Named Miss Marbles she showed little on the racetrack, but she had a certain half-sister in the Bart Cummings stable who was looking like Group 1 material. Alan got his first enquiry when Magical Miss won the 2001 Thousand Guineas and promptly put a $100,000 price tag on his Lure filly. “The prospective buyer thought she was overpriced, but rang back very promptly when Magical Miss won the VRC Oaks by five lengths”, recalled Alan. The price had doubled in the wake of the Group 1 win, but this time the interested party was happy to do business. Alan arrived at the 2002 Inglis Easter Yearling Sale with a firm resolve to buy another filly, but stopped in his tracks when the most magnificent Danehill colt walked by. “He was an absolute stunner and as a son of Danehill you knew he was going to attract a lot of attention”, recalled Alan. A short time later Alan was joined by Tim Martin, who’d trained a horse or two for him in the early days. “There’s a Danehill colt here that I’m not going home without”, enthused the trainer. “If I buy him would you take a share”. Alan had no sooner informed Tim that he might look at a ten per cent share, when Nick Moraitis appeared, excitedly declaring the handsome colt to be the pick of the Danehills. Alan took a backward step when Nick asked him to take a fifty per cent stake, but the fruit and vegetable king persisted. The horse destined to grace the racetrack as Exceed And Excel, was knocked down to Tim Martin for $360,000. In a weak moment, Alan made his biggest ever investment by securing a half share in a truly magnificent colt. Exceed And Excel, always a future stud proposition, raced only twelve times for seven wins and $1.2 million dollars. He won twice at Group 1 level, three times at Group 2 and once at group 3. Image courtesy Steve Hart Photographics - Exceed And Excel (Corey Brown) wins the 2004 Royal Sovereign Stakes from Ambulance (Darren Beadman). Ambulance later raced in Hong Kong as Lightning Star. He was sold to the Darley Australia Pty Ltd Syndicate, and has safely shuttled between Australia and Ireland for fourteen years. Alan negotiated a deal whereby he would have access to six services a year. The prominent lawyer made another wise judgement in 2000 when he attended the Karaka Yearling Sale in NZ with his good friend, breeder David Baxter. Alan took a liking to a Star Way filly, but Baxter didn’t share his enthusiasm. Alan went to $45,000 NZ for the filly, and later sent her to Clarry Conners at Warwick Farm. “She won a Gosford Maiden first up for Darren Beadman, and Clarry was pretty chuffed”, recalled the owner/breeder. “He thought she was an Oaks filly early in the piece, but the wheels fell off when she developed a breathing infirmity. Surgery was unsuccessful, so off to the stud went Whistle Dixie”. Her first foal was a 2005 filly by Exceed And Excel, who was no champion but did win four races as Dixie Lass. She won a maiden at Bathurst for Gayna Williams and a BM 50 at Muswellbrook for Kris Lees. Alan transferred her to Jon Walk in Brisbane, and she went on to win races at Eagle Farm and Caloundra. Her Falbrav colt won a Maiden at Geelong under the name of Able Green, before going to Macau. Renamed Excel, he later won a stakes race. Her colt by Authorised (Ire) raced as Authenticated. His connections enjoyed one minor thrill when, at his twentieth race start, he won a maiden on the Lakeside track by a whopping seven lengths. The gelding hasn’t won again in eleven starts and has been unplaced at his last three runs at Rockhampton, Chinchilla and Toowoomba. The family superstar Dixie Blossoms was the seventh and final foal of Whistle Dixie, who is now living out her days as a chaperone for weanling fillies at Torryburn Stud. As the dam of a Coolmore Classic winner, the twenty year old has achieved overnight celebrity status. Alan Osburg ventured into racing administration in 2011. He and John Cornish were prime movers in the famous merger between the Australian Jockey Club and the Sydney Turf Club. During his five year tenure as a Director on the Australian Turf Club board, Alan was very active in raising the necessary funds for the construction of the grandstand, which has taken Royal Randwick onto the world stage. He maintains a passionate, but low key interest in thoroughbred breeding with six broodmares split up between Torryburn and Berkeley Park Studs in the Hunter Valley. He and wife Lisa are regular visitors at both properties. Winx isn’t the only high profile race mare approaching retirement. Dixie Blossoms will definitely be at the stud come spring, but there are a couple of tempting options during the upcoming Championships. “I’ll be discussing our likely path with Ron Quinton this week”, said Alan. “There’s the Emancipation Stakes on March 30 and the Coolmore Legacy Stakes (Gr 1) on April 13. She’s also in the Doncaster with a handy weight”. In her current frame of mind, Dixie Blossoms may well improve on her already impressive record of seven wins and thirteen placings for $1,363,910. It’s worth another look at the Coolmore replay, to observe her reaction when she and El Dorado Dreaming went for the same split at the 200 metres. They bumped and Dixie came off second best, but the incident really switched her on. When Christian Reith came back inside the tiring Mandylion, she literally “charged” through the gap and put them away in a few strides. 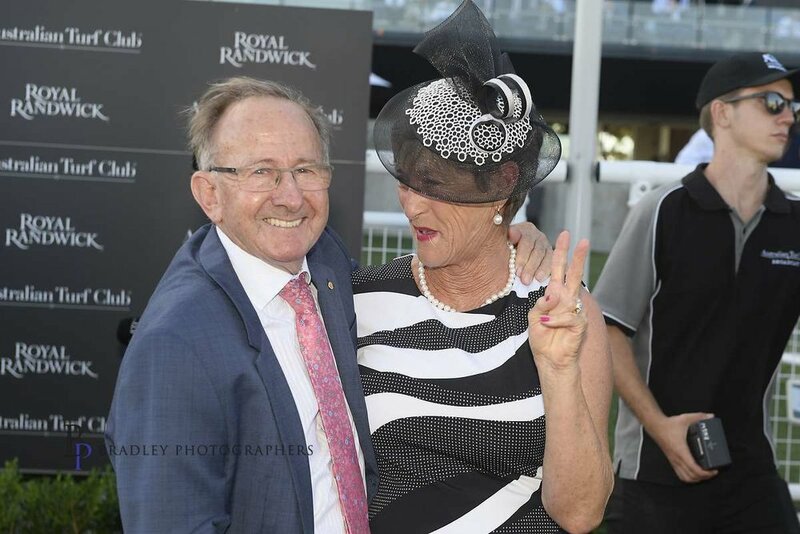 Image courtesy Bradley Photos - Ron Quinton with Wendy Walter after Dixie’s win in the 2017 Guy Walter Stakes. Lisa Osburg named Dixie Blossoms after a hit tune of the early twentieth century, written by Percy Wenrich, a famous musician of the day who popularised the famous “ragtime” genre. Finding suitable names for racehorses has always been a tedious task. Old song titles provide a never ending source of possibilities. There are thousands of them on the internet, waiting to be considered as a likely name for a budding champion racehorse. I’ll be surprised if Lisa Osburg hasn’t already put one or two aside.